Friend of mine complained to his wife that she was like a kid stepping into a toy shop when they went shopping at LCBO, as she was too excited to go home. The wife retaliated; “So what? I had fun looking at the wine labels, and time slipped away.” I agreed. Labels on wine bottles provide consumers with useful information. It’s fun to read the contents. There are about 1500 sake breweries in different regions all across Japan, producing over 10,000 types of sake under various brand names. Although LCBO carries merely 150 types of sake, it is likely that some brands I do not know. If it so happens there are no sake experts available at LCBO to give me sensible advice, I would go read the labels. Or, I use my cell phone to google the brewery’s official website to learn the characteristics of a sake before I make any purchase. More information I get, better chance I make good choices. Most sake bottles have two labels. Front label names the sake, and the back label gives you certain information about the sake. You can’t miss the labels as you can expect the aroma and flavours of a sake if you can decode the label. Terminologies, like “alcohol content”, “ingredients”, “net volume”, “production date”, are easy for consumers to understand. Whereas, what do “SMV” and “Acidity” mean in sake-brewing industry? Typical SMV values are between -3 (sweet) and +10 (dry). Is zero considered to be neutral? It used to be, but nowadays the point between sweet sake and dry sake is set to +3. However, there are more than one factor to determine the characteristics of each sake. Acidity level is something sake lovers also looking into. It indicates the concentration of acid, which is determined by titration with sodium hydroxide solution. The higher the number, the richer the sake becomes, and the lower the number, the lighter. Most brews resides between 1.3 and 1.5. Sakes with acidity levels below 1.3 tend to be light bodied, and levels above 1.5 ten to be full-bodied. The table below shows the balance between SMV and acidity level. 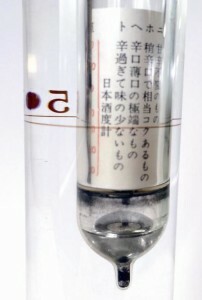 Some labels also show the amino acid level in the sake, which is the indicator for the taste of umami or savoriness. If the quantity of amino acids is high, the sake will have umami (or savoriness) and body, which is a good companion with savoury foods. Higher the level of amino acids is, stronger and heavier the flavour becomes. Whereas if the level is low, the flavour will be lighter and refreshing. Sake having low amino acid level is better to pair with mild foods. I realize that some sakes at LCBO do not have labels showing SMV, acidity level or amino acid level. Nevertheless, most sake breweries posted those on their official websites. Check them out before you pick up a sake and make your payment at cashier. Your chance of buying yourself a wrong sake is minimized. You need to bear in mind before drinking your sake, that the feel of sake in your mouth may be different from your imagination. Since it depends on the combination of factors represented by the SMV, the acidity level and the amino acid level, then the perception of dryness or sweetness, strength of flavour will all vary.